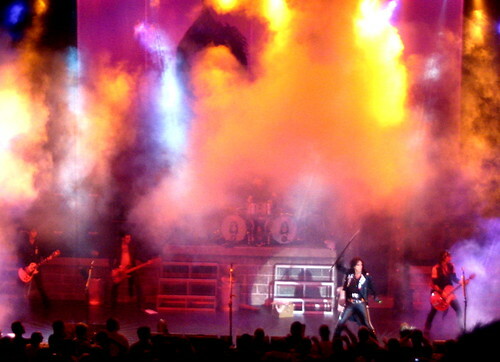 The Alice Cooper show at Ruth Eckerd Hall in Clearwater was so much fun. I never would have gone had my dad not invited me. The theatrics were predictable, but entertaining. After all these years of performing, Alice still has the energy and showmanship to make the get-out-of-the-straight-jacket schtick look like he hasn't done it 10,000 times already. He made at least three major costume changes and incorporated I don't know how many props--including strings of faux pearls, bright green money, a Frankenstein creature, a guillotine, giant balloons and a live albino boa constrictor. Also in the show is Alice's daughter, Calico Cooper, who dances around during about a third of the songs dressed as a whip girl, demented nurse or Paris Hilton. Of course, half the fun of going to the show was getting a look at the audience. There were a few teenagers, but the audience mostly included white couples in their 40s and 50s. Big Surprise. A lot of those couples also brought their kids; some of whom wore thick black eyeliner and were dressed all in black. That was cute in a weird sort of way. My dad was very pleased with the show. He's been a fan of Alice's since he was in high school. When "I'm Eighteen" started last night, my dad leaned over and yelled, "This came out when I was 18. It was so cool." Then he sang with the rest of the audience, "I'm eighteen and I don't know what I want." My friend just sent this link to me. It's an eBay listing for Ladner Greed T-shirts. Clever. Can I buy one of those instead of writing the check for my student loan next month? You know, the loan I got to pay for Ladner's personal chef to travel to London, Paris and Rome. At least the jerk didn't get the additional 5 million bucks he requested. I'm going to see Alice Cooper with my dad tonight. For real. Check out this fun cover of "School's Out (feat. Alice Cooper)" by Swedish pop group A*Teens. Heck yes I can be silly! A potentional employer asked the following during a telephone interview yesterday: "You'll have to act a little silly sometimes--can you be silly?" Duh. I'm super at being silly. The job is a part-time photographer working with children. I think that would be a pretty rotten full-time job. But as a part-time gig, I would get paid a decent amount and have the opportunity to work on my technical skills. The in-person interview is tomorrow. Now, what do I wear do convey my silliness? I stumbled upon this call for artists today while researching a project. Looks like a cool opportunity for my crafty compatriots (like the super cool Ms. Remain Fabulous). Speaking of crafters, I'm very sad that I'll miss Crafty Bastards this year. I had so much fun last year. Everyone in DC should head to Adams Morgan this Saturday to support those wacky people. This album got a lot of hipster buzz last year when it was released in the U.K. Hard to tell if the excitement will still be there when it comes out here next week on Columbia. The rock/soul layers of samples and instruments make this CD an interesting listen—good thing as it’s dominated by instrumental tracks. The retro feel is fun. We all love the 80s pop music, but The Go! Team stand apart from the 10,000 New Order-Police-Duran Duran-inspired bands releasing albums this week in that they seem to be influenced by 80s TV theme music. There’s something just a little bit cheesy about the music, but I can’t help dancing in my chair as I listen to it. The band will tour the U.S. next month in support of the release. My new Tampa blogger buddy, Rachel*, has gotten some good press lately as the local tabloids have discovered these blog things. And she's not popular just because she posts pics of herself in her underwear. Her writing is actually quite entertaining. Sharing the press is Tommy from Sticks of Fire--another one of my daily reads. If there's ever a Tampa Bayist, Tommy should be the editor. I like the concept of Venue--a group of visual artists and musicians playing in an electronic playground to create something fun and unconventional. However, the product of their experimentation is not easy to enjoy. The first time I listened to the CD at my desk, the disharmonious chords made me really nervous and distracted me from a project I was working on. There were a few choruses that I liked here and there, but I had to stop the CD half-way through because it annoyed me too much. I tried a second listen in my car and had a much better experience. Maybe the noise from the road muffled some of the tones to balance the harmonies. I don't know, but the CD just sounded better in the car. 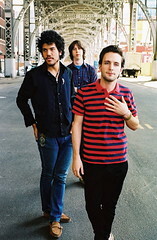 I want to see them live before I decide what I really think about Venue. Hey, students! You can win Larry David's Prius by signing up for the Stop Global Warming Virtual March on Washington. The rest of us can sign up for the virtual march, but no chance at the car. Rats. So, a virtual march? Doesn't seem to be able to make as powerful of a statement as an actual march. However, my back does hurt at the end of the day at those real marches, so maybe I'd like the virtual ones better. The Exit’s tracks remind me a lot of The Police’s Zenyatta Mondatta album--reggae beat with subtle 80s guitar riffs. It also has a cinematic feel to it. Definitely can imagine “Don’t Push” in an O.C. episode. Like, during a scene where Kirsten struggles with maintaining her sobriety while facing the challenges of mending her relationship with Sandy. Hello? Job, are you out there? Okay, so, I’m ready for a job now. Well, I actually don’t want a job. I want financing for my lifestyle. And since I’m not an heiress or willing to get myself a sugar daddy, getting a job seems to be my best option. So, I want one of those now so that I can buy CDs and travel some more and stuff. It’s not just the money I want. I also want to interact with some new people. And interacting with work people is fun. I love the ritual of finding out who is who and which person holds the key to the institutional knowledge and gossip. You get to play the game of getting a nugget of a story from that person, then sharing some of your own work stories to gain trust so that you can get the full story. You then learn about the social hierarchy of the work environment, the major characters and the history of the organization. Next, manipulate that information to your advantage and for entertainment. Oh yeah, I do miss work. My excitement lately consisted of getting my library card and driving my grandma and granddaddy for a day trip to De Soto National Memorial and Venice. The beaches between the De Soto Memorial and Sarasota are very, very pretty. Lots of sea oats, white sand and the water is emerald green. The views along Gulf of Mexico Drive actually look like the pictures in Florida tourism brochures. I get to drive down there tomorrow as I’m delivering someone to his uncle’s condo as a favor. That’s probably better than going to a job tomorrow. I went to the orientation last night for my gig at Amazing Kingdom of Thrills. They showed a video explaining the sexual harassment policy. It was narrated by animated lizards. Really. They also talked a lot about safety. I learned that I will be equipped with a whistle for emergencies. Emergencies, like, guests hitting the performers. Since this is an alcohol-driven event in Tampa, there's a decent chance that drunk rednecks will punch people in the haunted houses. Oh good. I am so living in a red state right now. I really have no excuse now for not updating my blog. I finally have a decent Internet connection and am in front of my computer pretty frequently now. The thing is, I feel kind of guilty about goofing off with blogging since I should focus all of my attention on finding a job and working on other projects. I guess I should just get over that. I witnessed (or at least heard) one of my brother's friends crash his car through a baracade and into a tree just outside my mom's house yesterday. My brother is always involved in some sort of drama like this, but this was the first time I was a witness to the drama. I feel like I'm part of the family again. The kids weren't hurt. They seemed to learn the very important lesson that going 60 mph down a dead end residential street is a bad idea. Stupid boys. After driving to Clearwater Beach to submit my prints to an arts and crafts festival jury, I drove to the other side of Tampa to hang out with my mom. We went to the nearly deserted Hillsborough River State Park and did a little hiking. Since there were only two people in the huge swimming pool, we decided to pay the $2 entry fee and take a dip. The woman in charge of the pool let us in for free since it was only open for another hour. Awesome! Free swimming. See . . . I don't need a job. Oh wait, but I do need a job because I just bought a new car. Who quits her job, travels around Europe and buys a brand new car? I'm ridiculous. I don't care, though, 'cause I'm happy and finding ways to make my situation work. And I totally heart my car. I bought an electric blue PT Cruiser. It's bright and silly--just like me. Right after buying it on Friday, I drove it to St. Augustine for the weekend. I stayed in the Pirate Haus Inn & Hostel. The proprietor, Captain Conrad, is super cool and makes awesome pancakes with little pirate faces on them. Lots of fun. Something I've been meaning to link to for a long time, but keep forgetting . . . if you're a basketball fan, you should check out Fantasy Basketblog. Two guys go into great detail about all things basketball. Not exactly my thing, but good writing.